When you’re thinking of upgrading your yo-yo, bearings are the most important part you can choose to improve its condition. We will have a special campaign to supply you with some extra bearings so you can have them at the ready! Please add an above bearing of choice to your cart. 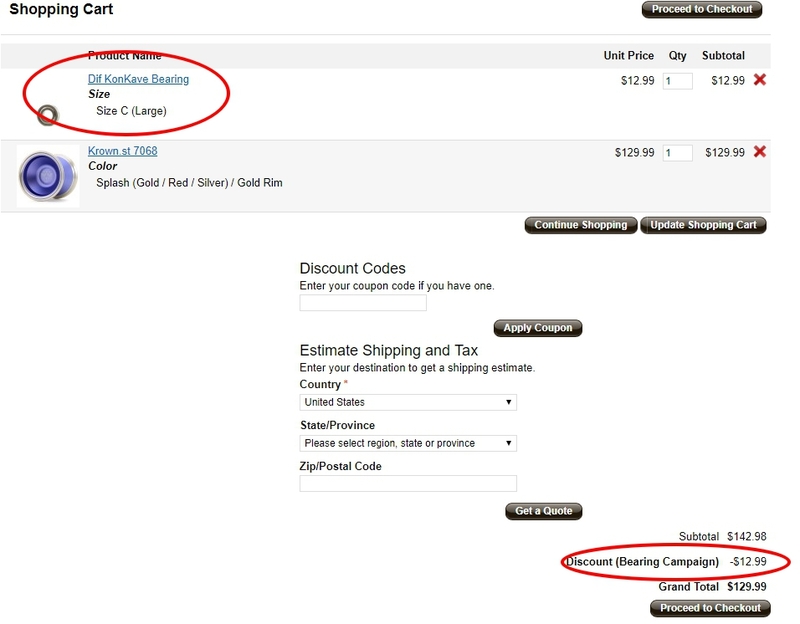 If the order total (minus the price of the campaign bearing(s)) is above $120, the cart will apply an automatic $12.99 discount to your cart for every $120 you spend. If you have an order totaling $360, your maximum discount will be $38.97. *Dif Ceramic Bearings are also subject to the campaign, but it will have a discount of $12.99 only instead of a Dif Ceramic bearing’s full price. Please make sure you add the bearing to the cart for the discount to be applied to the total. If the order is split into two orders we cannot apply the campaign. Limit 3 free bearings for one order. Even if you order more than $480, you can still only receive 3 free bearings. If you failed to add the bearing to the cart and already used the check out, please message us immediately before we ship (1pm Japan Time is the deadline for any changes or additions to orders) so we can fix your order. This is a perfect chance for you to stock up on high spec bearings! Better yet, get a free bearing for an easy upgrade to that model you’ve had your eye on. Don’t miss it! Until February 18th (Japan Time)!